This name uses Portuguese naming customs. The first or maternal family name is Mergen and the second or paternal family name is Taffarel. Cláudio André Mergen Taffarel (Brazilian Portuguese: [ˈklawdʒu tafaˈɾɛw]; born 8 May 1966) is a Brazilian retired footballer who played as a goalkeeper, and is the goalkeeping coach of the Brazil national team and Galatasaray. During an 18-year career he played professionally for five clubs, including Parma, Atlético Mineiro and Galatasaray. The recipient of more than 100 caps for Brazil, Taffarel helped the national team win the 1994 World Cup, also appearing in other eight major international tournaments over the course of one full decade, most notably helping Brazil to second place in the 1998 World Cup. Born in Santa Rosa, Rio Grande do Sul, Taffarel began his career playing for Sport Club Internacional but only appeared in 14 Série A games during his five-year spell, being however awarded the Golden Ball award for the 1988 season. In 1990, he moved abroad and joined Parma A.C. in Italy, freshly promoted to Serie A for the first time in its history; he proceeded to appear in all 34 league games in the following campaign, as the Emilia-Romagna side finished in sixth position and qualified to the UEFA Cup. In 1993, Taffarel, now only a backup at Parma, signed for fellow Serie A team A.C. Reggiana 1919, being first-choice in an eventual narrow escape from relegation. Afterwards, he returned to his home country and played three years with Clube Atlético Mineiro. Aged 32, Taffarel returned to Europe and joined Galatasaray S.K., winning six major trophies during his three-year stint, most notably two Süper Lig titles and the 1999–2000 UEFA Cup, a 4–1 penalty shootout defeat of Arsenal where he was chosen Man of the match (0–0 after 120 minutes); He closed out his career at the age of 37 with former club Parma, after one-and-a-half seasons as second-choice and after having refused an offer from Empoli FC: his car broke while he was going to sign the contract, which he later described as a "sign of God". In 2004, Taffarel rejoined Galatasaray as goalkeeper coach – under former teammate Gheorghe Hagi – returning to the club for the 2011–12 season, again with Fatih Terim as manager. Taffarel made his debut for Brazil on 7 July 1988 in the Australia Bicentenary Gold Cup, playing all four games and conceding two goals in an eventual win. He was also in goal for the following year's Copa América, in another international conquest (during his ten-year career, he appeared in five editions of the latter tournament). Taffarel was the starter for the nation during the 1994 FIFA World Cup in the United States, only allowing one goal in the first round and two in the knock-out phases, excluding two penalty kicks in the final. Four years later, in France, he helped the national team finish second, notably saving two penalties in the 4–2 shootout win over the Netherlands in the semi-finals. 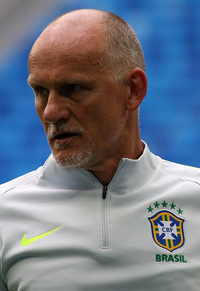 Taffarel played 101 times with the Seleção. Upon his retirement in 2003, coach Carlos Alberto Parreira offered to arrange a farewell match but the player refused, stating that he was not interested in such fanfare; he did return to play alongside Romário in late 2004 against Mexico, to commemorate the 1994 World Cup victory at the Los Angeles Memorial Coliseum. Regarded as one of the greatest Brazilian goalkeepers of all time, Taffarel was known to be a rational, consistent and effective keeper, with good fundamental goalkeeping technique, who favoured an efficient rather than spectacular playing style. His main attributes were his reflexes, positional sense, and composure in goal, as well as his penalty-stopping abilities; furthermore, he was known to be quick when coming off his line, and was also highly regarded for his skill with the ball at his feet. Due to his lack of height, however, he struggled at times when handling crosses. Taffarel and his former Atlético Mineiro teammate Paulo Roberto started up a player agency, with the focus mainly on promising youngsters. During the 1998 World Cup, when the Brazilian national team was training at Trois-Sapins stadium in Ozoir-la-Ferrière, a suburb southeast of Paris, the town's mayor proposed renaming the stadium after him. Nowadays he works as a goalkeeper coach for both Galatasaray and Brazilian national team. Taffarel is a born-again Christian who has actively shared his faith in numerous venues. He was a member of the Fellowship of Christian Athletes since 1988, and had 17 children, 15 of them adopted. ^ "Penalty heartbreak for Arsenal". BBC Sport. 17 May 2000. Retrieved 23 January 2017. ^ "Taffarel dice no all' Empoli Colpa di un guasto all' auto" [Taffarel says no to Empoli due to car malfunction]. Corriere della Sera (in Italian). 25 September 2003. Retrieved 29 May 2010. ^ a b "Football: God gave Taff a sign: The big interview; `You need to hit the darkest point to be able to appreciate the". The Free Library. 1 October 2003. Retrieved 29 May 2010. ^ "Greatness without glory: the story of Holland at France 98". These Football Times. 25 November 2016. Retrieved 23 January 2017. ^ "Brazil's greatest goalkeepers". Sky Sports. 2 July 2010. Retrieved 16 March 2018. ^ Christopher Atkins (10 January 2013). "Ranking Brazil's 10 Best Goalkeepers of All Time". Bleacher Report. Retrieved 21 January 2019. ^ a b c d e f g h i j k Darwin Pastorin (2002). "TAFFAREL, Cláudio André". Treccani: Enciclopedia dello Sport (in Italian). Retrieved 28 November 2017. ^ a b c Davide Martini (9 December 2015). "I 10 migliori portieri brasiliani della storia" [The 10 greatest goalkeepers of all time] (in Italian). www.90min.com. Retrieved 28 November 2017. ^ a b c d Fiorenzo Radogna (2 November 2016). "Portieri stranieri, ma perché? Quei campioni che in Italia hanno fallito dal '90 ad oggi – 2: Taffarel, il disoccupato che vinse un Mondiale (ai rigori)" [Foreign goalkeepers, but why? Those champions who failed in Italy from 1990 until today – 2: Taffarel, the unemployed who won a World Cup (on penalties)]. Il Corriere della Sera (in Italian). Retrieved 28 November 2017. ^ Simone Bernabei (8 May 2017). "Claudio Taffarel, dal Mondiale col Brasile alle esperienze con Parma e Reggiana" [Claudio Taffarel, from the World Cup with Brazil to his spells with Parma and Reggiana] (in Italian). www.tuttomercatoweb.com. Retrieved 28 November 2017. ^ Ricardo Setyon (1 August 2000). "Claudio Taffarel: "One mistake and I get all the blame"". FIFA. Retrieved 28 November 2017. ^ Rob Hughes (13 July 1994). "Chance of a Lifetime Is in Their Hands". The New York Times. Retrieved 29 January 2018. ^ "Fledgling careers in safe hands". FIFA. 16 July 2008. Archived from the original on 16 September 2008. Retrieved 16 July 2008. ^ "Claudio Taffarel – Futbol A Takım Kaleci Antrenörü – GALATASARAY.ORG". www.galatasaray.org. Retrieved 2018-06-20. ^ Clarey, Christopher (8 July 1998). "World Cup '98; Goalie has answers for Brazil fans". The New York Times. Retrieved 11 April 2010. ^ The Greatest Ever (2014). Greatest Ever Footballers. Headline. pp. 2058–2059. ISBN 978-1-4722-2705-8. ^ "Galatasaray 0–0 Beşiktaş" (in Turkish). Mackolik. 14 April 1999. Retrieved 17 June 2017. Wikimedia Commons has media related to Cláudio Taffarel. "CBF data" (in Portuguese). Archived from the original on 18 December 2013. Retrieved 16 September 2011. This page was last edited on 10 April 2019, at 15:56 (UTC).